Story and photos courtesy Oro Agri, Inc.
Noel Currie thought he knew quite a bit about calcium and potatoes. After all, as president as Aroostook Testing & Consulting Laboratory in Presque Island, Maine he has conducted trials for myriad calcium products from Maine to Florida for over 35 years. In addition, his father, who founded the consulting business forty years ago, was a “calcium nut” according to Noel. His father, he explained, strongly believed that calcium was THE essential nutrient that drove critical physiological functions within potato plants so Noel was indoctrinated about the importance of calcium starting early in his professional career. However, he learned from his applied field research on calcium products over the years that most supplemental calcium products are mostly useless in supplying essential levels of calcium to potato plants and especially to the tubers. So, he was understandably skeptical when he was asked by Oro Agri in the spring of 2018 to take a look at ENCOURAGE® NANOCAL®, its new soil-applied, sub-micronized liquid calcium product. Although skeptical, he felt obligated to trial the product because so many of his growers’ potatoes require supplemental calcium and the best products he could recommend, he and his clients knew, were not that effective. He agreed to run some trials on the off chance the product claims were true. However, Noel was so convinced that NANOCAL would not live up to its claims that he did not charge Oro Agri for conducting his field trials. He placed trials with clients who grew processing and seed potatoes in a 110-mile, north-to-south swath centered in Aroostook county. Now, after he has finished the field trials and analyzed the data Noel has switched from skeptic to believer. ENCOURAGE NANOCAL differs from other supplemental calcium products in several key attributes. First, the calcium carbonate particles in NANOCAL are milled to an average of 0.7 microns compared to a range of 3-80 microns for other calcium products. This extremely small size of the NANOCAL particles makes them readily available for root uptake upon application without waiting for the calcium to mineralize. The extremely small size of the NANOCAL particles also means that an application floods a plant’s root zone with significantly more calcium particles than the 3-80 micron-sized particles of other calcium products. To illustrate, picture the number of marbles in a five-gallon bucket versus the number of tennis balls in the same size bucket. More particles in the soil means more will come in contact with the meristematic region of growing roots for more rapid and efficient calcium uptake. Second, it is well established that calcium moves primarily through the plant’s transpiration system. For effective distribution of calcium in the plant it must be taken up by the roots and translocated throughout the plant, including to the tubers. Since foliar-applied calcium does not move very far in the potato plant developing tubers are often starved for calcium even with several foliar applications. NANOCAL, on the other hand, is designed to be soil-applied so it comes in direct contact with the roots for the most efficient uptake into the plant. It is formulated with Oro Agri’s patent-pending TransXylem™ technology that facilitates easy movement of material upward from the roots to other parts of the plant, including rapidly developing tubers. Milled to an average size of 0.7 microns, the calcium particles in NANOCAL are readily available for root uptake. The effectiveness of ENCOURAGE NANOCAL can also be attributed to its application timing. NANOCAL is designed to be applied just prior to or at hook. This is the growth phase of the tuber when calcium is most needed for healthy tuber development. It is not meant to correct calcium deficiencies in the soil but rather to be a readily available source of calcium during the critical cell division phase of tubers following hook. 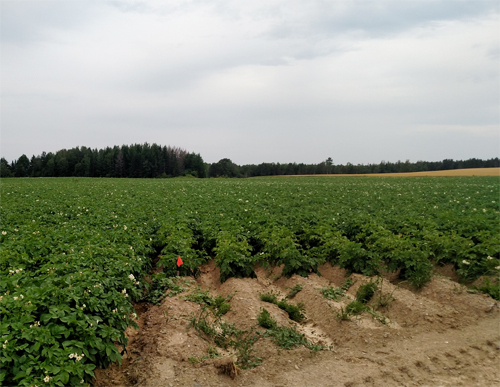 Even if gypsum or limestone are applied as part of a soil fertility program enough calcium may not be available to the potato plant during the high-demand period of tuber formation because of the slow mineralization of those materials. Starving tubers of calcium at this critical point can make them susceptible to physiological effects like pressure bruising and hollow heart. It can also limit the plant’s ability to fulfill its genetic potential for yield, specific gravity, marketable tubers and other key results. NANOCAL increased the specific gravity and periderm calcium in 100% of 2018 Maine trials. Noel admittedly was skeptical when he started the NANOCAL trials but after collecting 1850 data points across nine parameters related to yield along with specific gravity and tuber calcium measurements he admits NANOCAL should not be lumped in with all the mostly ineffective calcium products he has tested over the years. He is particularly impressed with NANOCAL’s performance in a tough year that started off cold and with no rain between April 15-May 15 and continued under drought conditions with high temperatures. Specific gravity — 100% of the trials showed an increase in specific gravity. The increases ranged from 0.004 to 0.009 with an average increase of 0.00633. This increase in specific gravity is especially significant to Noel because the majority of his growers serve the chipping and French fry markets. Tuber calcium — 100% of the trials resulted in an increase in periderm calcium at trial application rates and indicated there is a rate response to increasing rates of NANOCAL. Noel feels this will have a significant reduction in pressure bruising and will be a huge benefit for his seed growers. Field Weight and Calculated Yield — These two related metrics showed a positive response to NANOCAL in 80% of the trials Noel conducted. 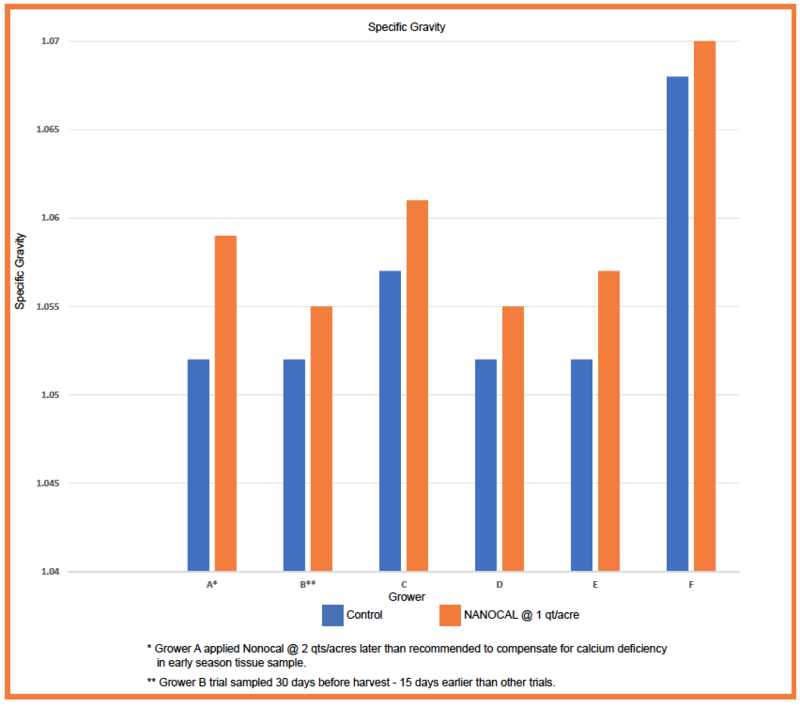 Even a trial where NANOCAL was experimentally used to correct a soil calcium deficiency and was applied late showed a positive yield response. “I have never seen this happen before with a calcium product” was Noel’s response to these key results. In addition to these direct effects Noel ran some pro-forma financial results that really turned him from skeptic to believer. When he calculated the Change in Calculated Yield, Size Distribution and Mean Weight per Tuber for all his trials and assumed a 300 cwt/acre yield and a $10/cwt price, all three parameters resulted in a positive financial impact and Return on Investment of 13%, 14.3% and 4.7% respectively. Noel now admits that after his experience with NANOCAL he can still learn a thing or two about calcium. And, he is finally comfortable that he can recommend, with a high degree of confidence, a calcium product to his growers that will deliver a better potato and a better pay day.